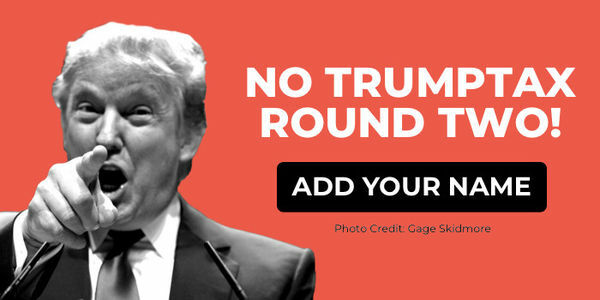 petition: Sign now – No TrumpTax Round Two! Sign now – No TrumpTax Round Two! Congressional Republicans just released their plan to pass Round Two of the TrumpTax with even more tax giveaways to the rich. We all remember TrumpTax Round One: The $1.9 trillion giveaway to millionaires, billionaires, and wealthy corporations that stripped heath care from 13 million Americans. Round Two looks to do even more of the same. Republicans don't know how to pay for these giveaways, and now they're looking to slash funding for programs we rely on most — like Medicare, Medicaid, and Social Security — to make up for it. We must fight back. We can't allow Republicans to give even more to the rich at our expense. Add your name if you agree: No TrumpTax Round Two!